Forgiveness is something that resides in each of us, but often remains asleep until we awaken its potential. 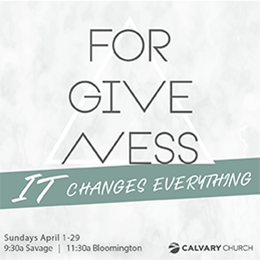 In our new series "Forgiveness" we will uncover and stir this sleeping giant. You will see how it has the potential to change everything! No one that is trying to make their life better wants to be held to their history. Forgiveness has the power to break the cords that hold us back. It is strong enough to change our life, relationships and even our country. You don't want to miss a single message in this series...so, make plans now to attend each week!